Topics: Scotland, All Yachts, Raphy G, Chantilly, and Oceanlord. The estimated 28 daily visitors, each view 2.00 pages on average. onesail.co.uk Onesail: Sailing holidays for those who don&apos;t sail (yet). Iomart Dc1 Core Network (Scotland, Glasgow) is the location of the Apache/2 server. 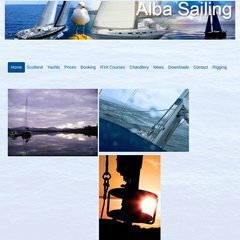 Alba-sailing.co.uk's server IP number is 62.233.121.26. Its 2 nameservers are ns1.namecity.com, and ns2.namecity.com. PING www. (62.233.121.26) 56(84) bytes of data.